When it comes to installing antivirus on your PC you always ask your friend or shopkeeper which one is the best antivirus for Windows PC. In the market, there are lots of antiviruses and every antivirus promises better security for your Windows 10 PC. But what antivirus really works great in Windows 10 PC. So you need to know the benchmark or real world test report of these antiviruses before purchasing or installing on your PC. AV-TEST, an independent antivirus testing organization do it very well. 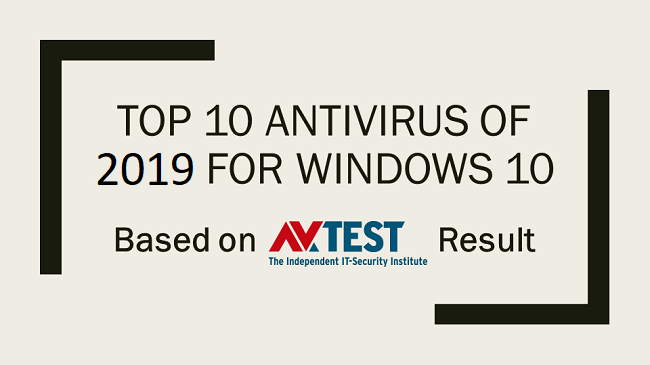 On the basis of this report, I am listing top 10 antiviruses of 2019 for Windows 10 PC. As per the December 2018 test report for home users antivirus, I have drawn a top 10 list but the list is quite amazing. Because nowadays every well know and some other antivirus software companies doing great in terms of security, performance and usability. There was a time antivirus software slows down PC but now you wouldn’t realize that. Moreover, you don’t need to do play with it, the antivirus software will do all the things to give better security. AV-TEST benchmark or test these all home user antivirus on three parameters. Here they are- A> Protection: Protection against malware infections (Such as viruses, worms or Trojan horses) B> Performance: Average influence of the product on computer speed in daily usage. C> Usability: Impact of the security software on the usability of the whole computer. Now comes to December 2018 home user antivirus test report by AV-TEST is really shocking and its makes a crazy top 10 list here. Basically, I have listed top 11 antivirus software where 7 antivirus software snatches the first position and remaining four snatches the 2nd position. Here is the list. So you can grab any of these 11 antiviruses for your Windows 10 PC as you will get protection top notch. In this list, if you are seeking free one then you can try AVG Internet Security.